Purpose. Dark exposures are measured to monitor the status of the detector array. They can also be used to subtract the dark current in science frames. 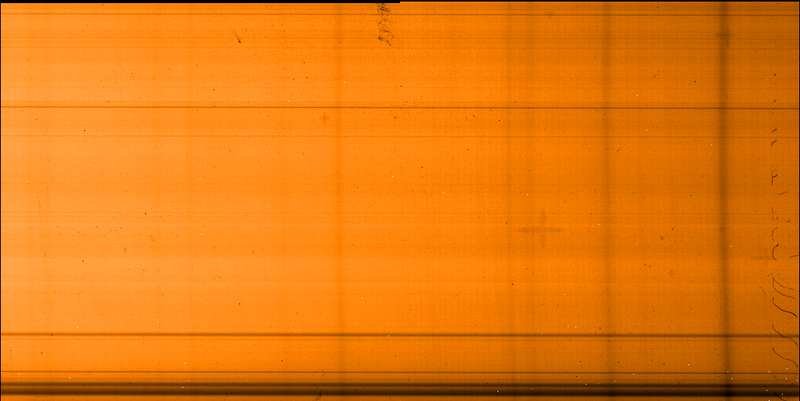 They are routinely measured every night when CRIRES is operational and come as a stack of 3 raw frames. They are combined into one master dark product and quality-checked on the mountain and by QC Garching. Recipe. The pipeline recipe crires_spec_dark combines 3 raw darks by median-stacking. QC checks. The pipeline measures median values, read noise and the standard deviation of the input frames. Trending. Click here for trending results. Purpose. The CRIRES arrays become nonlinear for exposure levels above approximately 4000 ADUs. This behaviour is assessed by a series of DARK and FLAT exposures with increasing DIT. is fit. The B coefficients basically reflect the unknown intensity of the flat-field lamp whereas deviations from linearity are measured via the C coefficients. The output of the recipe consists of 3 images for the A, B, and C coefficients, respectively, and an additional image ("Q") with the deviations from the fit. QC checks. The pipeline reports median values for the coefficients and the deviation. Trending. The effective non-linearity is trended here. Purpose. A series of DARK and FLAT exposures with increasing DIT to measure non-linearity and gain. is fit. The B coefficients basically reflect the unknown intensity of the flat-field lamp whereas deviations from linearity are measured via the C coefficients. The output of the recipe consists of 3 images for the A, B, and C coefficients, respectively, which are stored in one product (LINGAIN_COEFFS). QC checks. The pipeline reports median values for the coefficients and an effective non-linearity correction at a given exposure level. is fit. The B coefficients basically reflect the unknown intensity of the flat-field lamp whereas deviations from linearity are measured via the C coefficients. The output of the recipe consists of 3 images for the A, B, and C coefficients, respectively, which are stored in one product (COEFFS_CUBE). The generic recipe detmon_ir_lg replaces the above mentioned CRIRES-specific recipes with pipeline version 2.1 and later. Purpose. 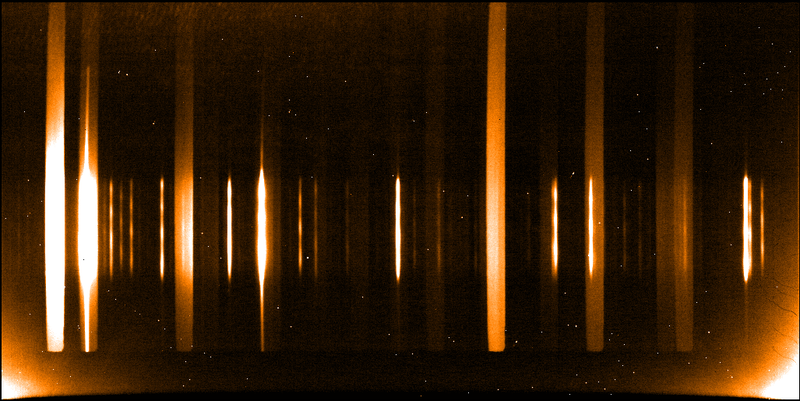 Flat fields for CRIRES are measured by illuminating the spectrograph with a halogen lamp. They are used to determine the overall spectral curvature (blaze function), gain variations from pixel to pixel (fixed-pattern noise), and bad pixel maps. Recipe. The pipeline recipe crires_spec_flat operates on single flat exposures or on a set of frames. First, the recipe subtracts a master dark frame from each input raw flat. The dark should have the same DIT as the flat. If non-linearity coefficient maps are present then the flats are corrected for non-linearity. If more than one raw file is submitted to the recipe then the frames are averaged. The master flat is then normalised by its median level. Bad pixels are defined as those pixels with values outside given thresholds in the normalised frames. QC checks. The pipeline measures the mean flux of the input raw frame, the standard deviation of the product, and the total number of bad pixels. Trending. The stability of the flats is trended here. Purpose. CRIRES offers two different calibration units for wavelength calibration: a ThAr arc lamp and a gas cell which is filled with N2O and illuminated by the flat (halogen) lamp. Calibration frames having the emission spectrum of the arc lamp are identified by the header key DPR.TYPE = WAVE, LAMP. The absorption line spectrum of the gas cell can be found in files with DPR.TYPE = WAVE, ABSORPTION-CELL. Both types can be used to determine a wavelength solution for science (and standard star) observations. A detailed description of the recommended wavelength ranges can be found in the User Manual. for each detector separately. The algorithm starts with a linear solution and varies the polynomial coefficients. For each variation, a cross-correlation between the input frame and a template is performed. The template is constructed from the (static) line catalog. The solution with the highest cross-correlation value (which can be between 0 and 1) is finally selected. For Service Mode observations, a second order polynomial is chosen. The cross-correlation is regarded as successful if a value higher than 0.2 is reached for the final result. Otherwise, the solution is rejected and the default linear estimate is taken. Physical Model. The recipe crires_spec_wavecal also calls a physical model which predicts a wavelength for each pixel on the basis of the instrumental setting. The physical model requires an input model configuration file (PRO.CATG = CALPRO_MODEL_CONFIG). Details about the model can be found in Bristow et al. 2006 (Proc. SPIE 6270, 62701T). QC checks. The result of the cross-correlation, the wavelength of the central pixel, and the dispersion are calculated for each detector. Trending. Wavelength calibration is trended here. Products. The main product is the dispersion solution file which contains a fits table in each extension with the polynomial coefficients of the wavelength solution. This is also transformed into a 2D wavelength map which gives the wavelength for each pixel. The result from the physical model is also given in form of a wavelength map. Purpose. Telluric standard stars are observed on request by the user. A small set of spectro-photometric standard stars is regularly measured by the observatory for monitoring the overall instrument efficiency. Recipe. Standard stars are processed by the same recipe as science observations: crires_spec_jitter. The same types output files are produced (with different PRO.CATG header keywords). When a table with flux values for a spectro-photometric standard is provided then the recipe calculates in addition conversion factors, throughput, and sensitivity. QC checks. Median values for sensitivity, throughput, and conversion factor; average spectral position on the detector.